Pleased to announce that my sixth full-length poetry collection, Ex-ville, was published by Oolichan Books in November 2014. For more detail on current and upcoming activities please check the Events page. June 23-27, in Moscow Idaho: at the ASLE biennial conference; panelist (Rhizomorphic Resonances: Underground EcoActivisms in Life and in Literature) and at the Authors Reception. Sunday May 10, from 3-5pm at Vancouver Public Library Central Branch, 350 West Georgia: I’ll be introducing and reading Maxine Kumin‘s work at the Dead Poets Reading Series. Wednesday April 29, 6pm for 7 o’clock reading: gather at Haliburton Community Organic Farm for a Food, Farming & Fishing Free Range Poetry Buffet at Haliburton Community Organic Farm, with Rhona McAdam, Brian Brett, Linda Rogers and Dennis Reid. Saturday April 25, 10am and 2pm: Poets Converse With Street Art – a poem walking tour sponsored by the City of Victoria, Greater Victoria Public Library and Open Space Gallery. Hosted by Poet Laureate Yvonne Blomer and Youth Poet Laureate Zoé Duhaime, with guest poets Wendy Morton, Garth Martens, Rhona McAdam and Daniel G. Scott. Wednesday April 8, 7:30pm Read Local BC event, Poetry Without Borders, at Munro’s Books in downtown Victoria. Reading by local poets Rhona McAdam Patrick Friesen, Beth Kope and Inge Israel. Tuesday January 27, 8pm featured reader, with Rebecca Perry, at CB1 Poetry in Cambridge. Gonville Hotel, Gonville Place, Cambridge CB1 1LY. Wednesday January 21, 7pm reading with Tamar Yoseloff and Sue Rose, at the Travelling Through Bookshop, 131 Lower Marsh, London SE1 7AE. Wednesday January 14, 8pm, reading with Tania Hershman, Loose Muse, Poetry Society in Covent Garden, 22 Betterton Street, London WC2H 9BX. Wednesday January 7, 2015 reading with the Telltale Poets – Peter Kenny, Catherine Smith, Siegfried Baber and Robin Houghton at the Poetry Society in Covent Garden, 22 Betterton Street, London WC2H 9BX. November 26, 2014 at 7pm: reading at the Fat Oyster Reading series, with Des Kennedy and Bruce Rice, at Fanny Bay Hall, at 7793 Island Highway, Fanny Bay, BC. November 21 2014 at 8pm Read from my new poetry collection Ex-ville (published November 2014, Oolichan Books) at Planet Earth Poetry, Hillside Coffee & Tea, Victoria BC. Reading and book signing at Ten Old Books just down the street from the Duncan farmers market on Saturday August 10, 2013. Read at the anthology launch of Untying The Apron: Daughters Remember Mothers of the 1950s, at Planet Earth Poetry, Victoria, Friday May 17, 2013. Read at the anthology launch of Poems from Planet Earth (Leaf Press), at Planet Earth Poetry, Victoria, April 12, 2013. Panelist talking about food writing at the Malahat Review’s WordThaw event on Saturday March 23, 2013 at the University of Victoria. Read poetry plus prose from Digging the City at Planet Earth Poetry, Victoria, 22 March 2013, with visiting poet Rosemary Griebel. Read from Digging the City at the fabulous Village Books in Fairhaven, Bellingham WA on Sunday Feb 3. Discussion/presentation with the Victoria Horticultural Society’s Fruit & Vegetable Group on Monday January 28, 2013, on the topic Seeds of Community: Seed saving and community seed banks. I had a great time talking about Digging the City: An Urban Agriculture Manifesto with Stephen Whipp’s Ethical Investing clients on 8th December, 2012. Launch: Digging the City: An Urban Agriculture Manifesto at the Cornerstone Cafe, on November 27, 2012. I presented Digging the City: An Urban Agriculture Manifesto at the Heritage House Publishing Author Celebration in Victoria on November 22, 2012. 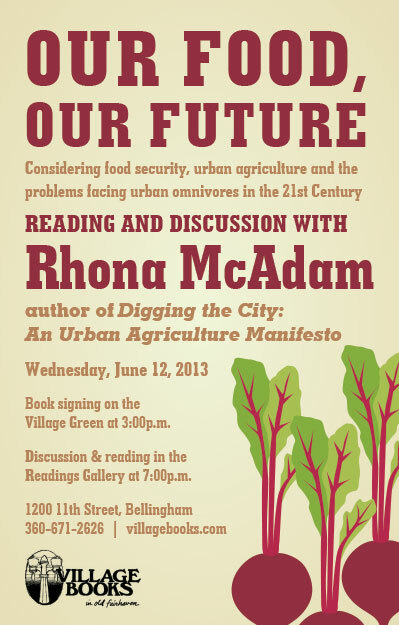 Book talk on Digging the City: An Urban Agriculture Manifesto. Saanich Centennial Library, Victoria. September 2012. I organized a panel discussion and baking workshop for Andrew Whitley’s visit to Victoria September 2012. Poetry reading: An Evening of Canadian Poetry, Vancouver Public Library, Alma VanDusen & Peter Kaye Rooms, Lower Level, Central Library 350 West Georgia Street March, 2012 (with Ruth Roach Pierson and ED Blodgett). Talk: CSA: The Acronym of Our Time at Ideawave 2012, Ambrosia Centre, 638 Fisgard Ave, Victoria. February, 2012. Poems from Planet Earth: the Planet Earth Poetry anthology, due out from Leaf Press January 2013. Untying the Apron: Daughters Remember Mothers of the 1950s, edited by Lorri Neilsen Glenn; due out from Guernica in 2013.
Review of Eating on the Wild Side by Jo Robinson, in Small Farm Canada, March/April 2014. 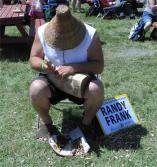 A Last Bite of Summer: The Flavour Gourmet Picnic. EAT Magazine (October 2012). Prime Pollinators: More than honeybees in the fields; and Will Allen’s Powerful Message: Growing out of poverty. Small Farm Canada (March/April 2011). Deep Waters: Rivers, Lakes & Seas anthology, Outrider Press. Going Behind the Scenes: Education at Kettle’s Yard.